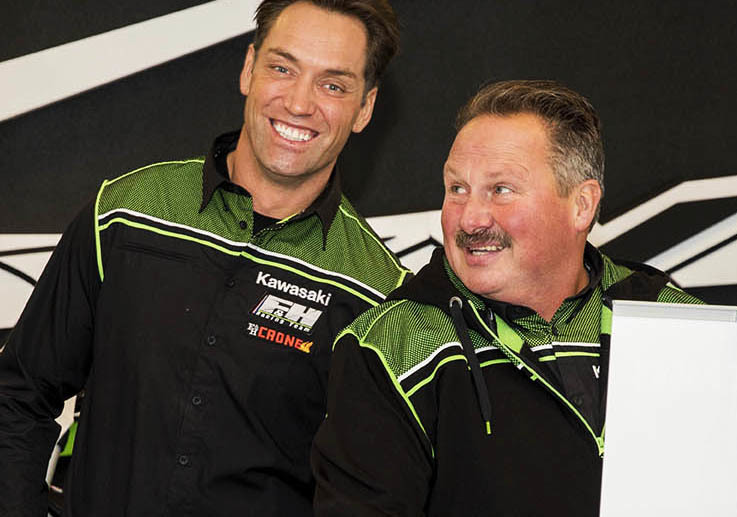 Marc De Reuver of the F&H Kawasaki team knows something about how a team has to be, to be successful. The Dutchman, who races for factory teams with KTM, Yamaha and Honda, and won a handful of GP’s, is excited for 2019, and he has every right to be. It should be pointed out, De Reuver helped Pauls Jonass to a World MX2 championship, and then worked with Jed Beaton, who did well enough to pick up a factory ride with the Husqvarna team. Its little surprise that riders perform under the eye of De Reuver. His knowledge in the sport is huge and while he trains the riders, he is also giving them daily advice on how to keep it real, in a sport that takes more prisoners than not. MXlarge: Marc, everyone is preparing for the 2019 season, and I know the team opened their work-shop last week, and it seems like the team continues to progress? De Reuver: It does Geoff. They opened their store, selling Kawasaki machines, parts, tyres, and other products. It’s a really beautiful facility. MXlarge: How professional has the team gotten over the last 12 months? De Reuver: People don’t understand, 12 months ago, there was nothing, and they built it up to a mega team, it’s like a factory team. We are private and doing our own thing, but it’s like a factory team. MXlarge: I was speaking to somebody on Monday, and we were talking about how much the F&H Kawasaki team has improved. De Reuver: Steve Guttridge from Kawasaki was in our work-shop this week, he was really impressed with it. Also the big boss from Kawasaki Europe. You know, I am from Amstelveen and so is he, and we had a good connection straight away. It was a nice day. MXlarge: This year, not only has the team grown, but the whole team. De Reuver: What has improved a lot, is the bike. The whole package is so much better, really a top bike. With Adam Sterry, Henri Jacobi, Roan van de Moosdijk. Roan will ride in the EMX. I can only be very happy on this moment seeing how we have progressed. 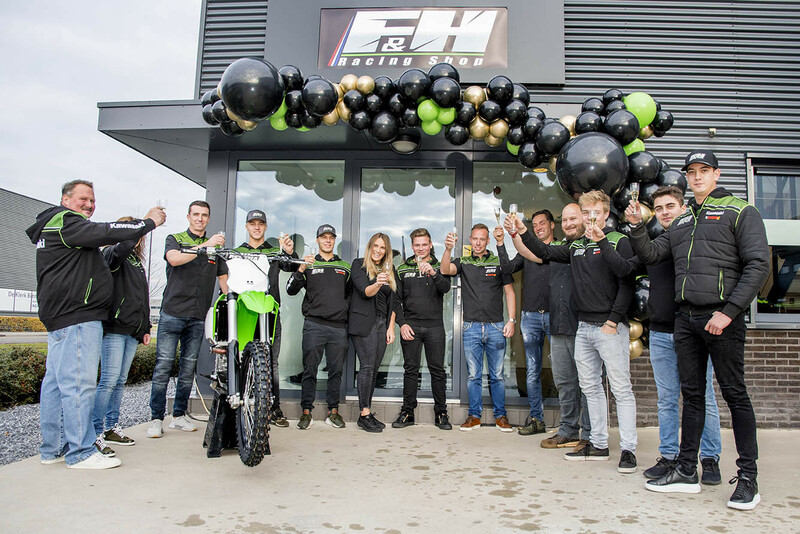 MXlarge: Speaking of Jacobi, I did an interview with him about a month ago, and he mentioned how big an improvement it was to move to the F&H Kawasaki team, with the support and everything. How has he been coming on in your eyes? De Reuver: He is really good. What I see from him now, and how surprised he is with things I tell him, and how he improves from that, I am very surprised he was able to be top five before. The things we are teaching him, even just daily life, if he keeps improving, we have a serious rider. But the same with Adam (Sterry). Last year he came to me a little broken, but now he can start my program from the beginning, and you see the improvement. They are all training together and even if Roan might be faster sometimes, they don’t care, because he is EMX, but it helps each other to train together. MXlarge: Tell me about Van de Moosdijk. We have heard about him for years, and he is obviously Dutch. What is his potential? De Reuver: He has just turned 18 and he was third in the EMX and people said he should go straight to MX2, but the problem with that, moving to the MX2 can make you, or break you, and he is just 18, so he will still have four years in MX2 when he moves up in 2020. He might do some GPs, but if he is leading the EMX, then we won’t risk putting him in the MX2 class. MXlarge: It is a difficult one, because some riders can move up quickly, like a Herlings, or Prado, but not everyone can be 18 and move into the World championships? De Reuver: That is why I wanted him to stay in EMX, I talked to my boss and fortunately he listened and I think this will work out great. Look at Lupino back in the day, he moved up too quickly and it has taken him years, because it broke him at that time. MXlarge: Obviously having a guy like you involved, somebody with so much experience, that has to be the bigger factor that helps these younger riders? De Reuver: Yes, but I am not just a trainer, like I was with Jonass and Jed. I stay with Roan in the hotel room, and the learning continues. MXlarge: Like a father figure? De Reuver: More like a big brother. I am so super pumped about 2019, just really happy. MXlarge: But what is the potential of Van de Moosdijk, a GP winner? De Reuver: Yes, 100%, but people forget, look at Lesiardo from 2017, he was strong in EMX250, but this year, he did nothing. This is how critical in this period, it can make or break you. Look at Jed, he is now a factory rider. Look at Prado, he wasn’t consistent in 2017, but then he got the structure in 2018, and you see the difference. He went from being not consistent be being World champion. MXlarge: What I find amazing, when you look at the top guys, a lot of guys have that inner circle, be it parents, or good friends. Jeffrey has his inner circle, that has been like that for probably 10 years, Antonio has Jill, and De Carli, and a circle of good friends. That inner-circle seems to be everything for a rider? De Reuver: Yes, you need a family feeling and for some riders dads don’t work at all, and I am not a big fan of fathers being involved, it can break your career. Your dad doesn’t have to say anything, you just see his face and you know. That can also break a rider. I had a good connection with my dad, but also some days not. MXlarge: Saying and doing the correct thing with a person isn’t easy. It doesn’t matter if it is just in normal life, or to a sportsman. 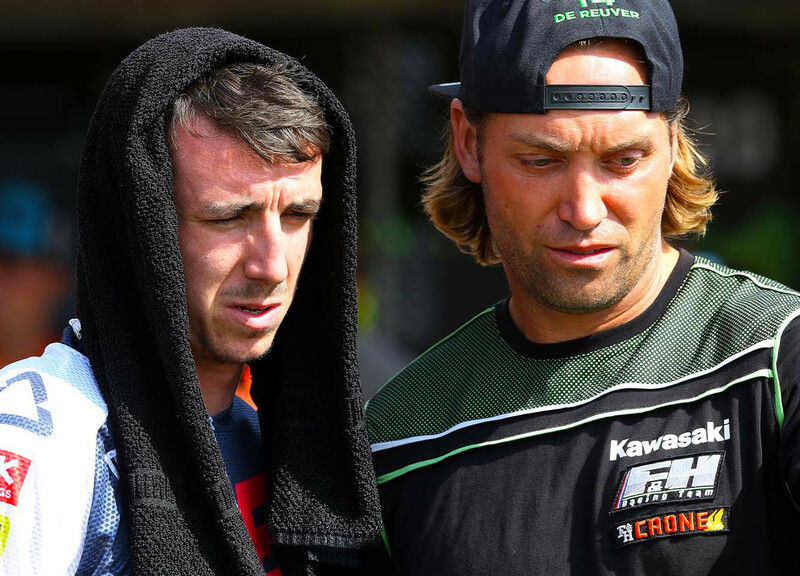 What about Adam (Sterry), what does he need to improve? De Reuver: I have three guys who are very different and you need to talk to them differently and be aware of what they need to hear. Adam, he needs to improve in the racing. In Lommel, in the warm-up he was the fastest rider and everyone in the team was very happy, but I looked into his eyes when he went to the start gate, for the first moto, and I saw in his eyes, that it wasn’t going to happen in the moto’s. He needs to bring what he does in practice into the races and I think he will in 2019. MXlarge: Is that mentally preparing him for what might happen in a race? De Reuver: But that is what I say, I am not only a trainer, and the difficult part of my job, these guys are not all the same. Roan is different, and Henry is a little over confident, so I need to be less with him. Adam doesn’t get overexcited, but if you are a second faster than Jonass and two seconds faster than Prado in practice, you need to switch some buttons in your head, because it doesn’t always go as you might think. MXlarge: And what are the riders doing now until the pre-season races? De Reuver: We did two weeks in the sand in Holland, and now we are in Spain and then they ride at home and from Christmas until New Year they won’t ride, then we ride at home, then two weeks in Spain, before heading to Ottobiano for our first race. We will also do Hawkstone Park in England, and Lacapelle in France.